Our New York notary stamp uses the approved layout for the State of New York. 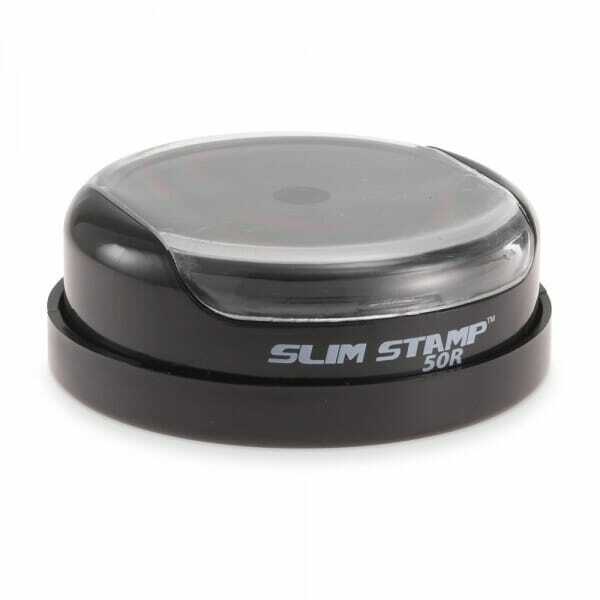 The Slim Stamp 50R round stamp has a maximum text plate size of 2" diameter allowing you to create up to 12 lines of customized text. This sleek, compact stamp fits easily in your pocket, and the closing cap keeps the ink where it belongs--on the stamp! Perfect for notary stamps, corporate seals, engineer stamps, or monogram address stamps. You can upload your own logo or artwork in our stamp wizard! The Slim Stamp uses a low emissions manufacturing process with no added chemicals. Good for thousands of impressions, ink can easily be added to the stamp to extend its life even more. Use only MaxLight ink. Customer evaluation "New York Notary Pre-Inked Pocket Stamp - 2 Diam. Round"